Have you ever wondered about tumbling your way into shape? If you have an in-ground trampoline it is an ideal way to not only have fun but to get in shape as well. Who can ask for more than that!? It seems that most everyone is looking for ways to stay fit but are, frankly, bored with jogging, lifting weights and other forms of exercise. They want to stay fit and have fun while doing it. Rebounding exercises, on your in-ground trampoline, is one of the healthiest and safest exercises for both your joints and your cardiovascular system. Jogging puts stress on your joints as do other impact-based exercises. Jumping on an in-ground trampoline puts no stress or strain on your joints and it’s fun! Did you know? Trampolining has been recognized as an Olympic sport and became one of the gymnastics sports in 2000. There is synchronized tramplolining — where two athletes perform identical routines on separate trampolines, there is also the mini-trampoline doubles and others. You don’t have to have Olympic-sized ambitions to enjoy the fun of exercising on an in-ground trampoline. Another benefit? If you have an in-ground trampoline, you don’t even have to leave your house in order to work out. 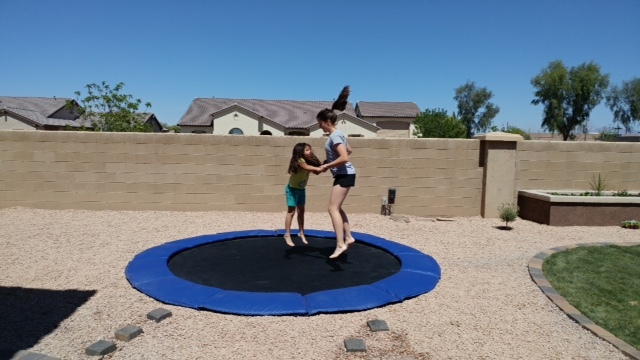 When you’re investing in an in-ground trampoline you need to find an area of your yard that has no obstructions — from above or off to the sides. You will need to decide what size trampoline to invest in and how much yard space you want to give up for it. Remember, though with an in-ground trampoline, it will virtually blend in with its surroundings — no unsightly above ground trampoline to detract from the beauty of your yard. If you have children in the house you may want to check with their pediatrician as to whether it’s safe for them to jump on. He or she will likely say yes as long as there is always adult supervision and that only one child jumps at a time. Injuries arise when two jumping children crash into one another. When you’re looking for a fun, healthful way to get in shape, look into rebounding!